I recently decided to try some faster memory in my Canon 70D camera for shooting RAW photos. I take a lot of action photography and RAW files are very big and I wanted faster SD cards to write the files. I had an assumption that you did not need to pay for the Sandisk name to get decent write speeds from other companies like Transcend. Well I was wrong. I used a Transcend USB 3.0 card reader on a Windows 7 system with an Asus Z-97A motherboard with a Haswell Core i7. I made sure the card reader was using a USB 3.0 port on the computer. I used Crystal Disk Info 3.03 to test the media speeds. 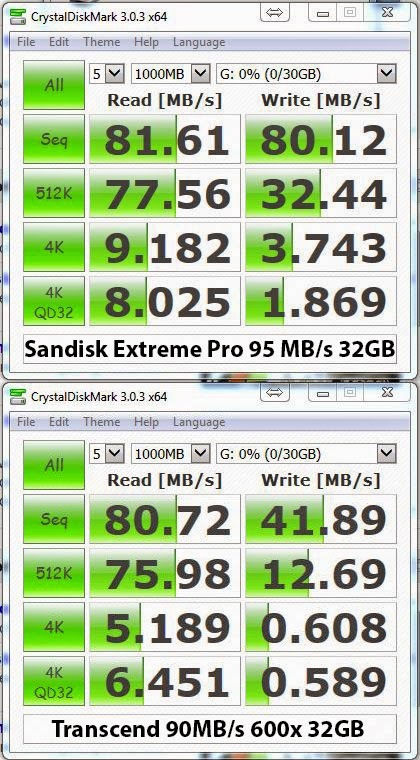 I was surprised that the Transcend 600x is about ½ the write speed of the Sandisk Extreme Pro. The Transcend claims speeds up to 90 MB/s vs Sandisk of 95 MB/s. Both cards were purchased the same day from Amazon on December 2014. The Sandisk was $45 vs the Transcend being $18. Both cards are 32GB. The read speeds were about the same averaging 80 MB/s. The write speeds were 80 MB/s (Sandisk) vs 41 MB/s (Transcend). If your camera is fairly new and can properly take advantages of the high write speeds, you may want to consider paying the premium for the Sandisk name. It clearly is the winner in write speeds.